Seen on Twitter the past few days is the heady news that the Washington Wizards went .500 in November — tied for the franchise’s third best winning percentage for month in the past 30 years. Forgive me if I don’t join the parade. For a team like the San Antonio Spurs — a good team that competes for championships — the same record would be their ninth worst in the same time span. A .500 record for a month is not cause for celebration. The Wizards have a good starting group, but an awful bench. The net result: precisely average. The team is improved, but that’s not the same thing as being good. In a weak East where several teams are tanking, even a meh team can make the playoffs. All that said, let me reiterate — the Wizards are improved. John Wall is the best PG in the East, and currently ranks 7th overall at his position. 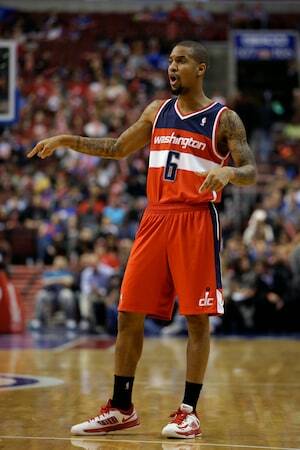 The team is getting well-above average play from Martell Webster, Trevor Ariza, Marcin Gortat and Nene. The team’s depth makes any success feel tenuous, but they have a core of good players for this season. One common thread of Wizards discussion I’d like to address before posting the weekly PPA update is this notion that PG Eric Maynor was at some point “good” and that he’s abruptly and inexplicably gotten worse in Washington. The facts are that Maynor has been a sub-par player throughout his career. That people believed otherwise is testament to attributing to Maynor that which should have been attributed to his teammates. In other words, folks believed Maynor was causing (or contributing) teammates to be better when, in fact, those other players were producing on their own. The reason I’m addressing this topic is that asserting that Maynor was at some point “good” or “serviceable” is to let the Wizards’ front office off the hook. In reality, signing Maynor was a terrible waste of resources, and evidence that Ernie Grunfeld and his team still haven’t figured out how to evaluate players. They thought they were getting a steal. Instead, they were getting a lemon. And what’s head-bangingly frustrating is that fairly rudimentary look at the numbers would have told them so. With that out of the way, here’s the weekly Player Production Average update. PPA is a player rating stat I developed. It credits players for things that contribute to winning and debits them for things that don’t — each in proper proportion. PPA is pace adjusted, accounts for defense and includes a degree of difficulty factor. In PPA, 100 = average, higher is better and 45 = replacement level. What jumps out? On the plus side, the team has a good group of starters. Wall appears to be doing what I predicted at the start of the season — making The Leap to becoming a top-shelf PG. Webster, Gortat, Ariza and Nene round out a quality lineup. On the down side, there’s the rest of the team. Booker has dipped below average for the first time this season on scant playing time. So far this season, the team falls apart on defense when Booker is on the floor. Vesely appears to be the beneficiary of lowered expectations from fans. He was so inept last season that anything positive gets exaggerated. He is better than last season in that his play hasn’t been a total train wreck. But, he remains well below average. Some fans (and perhaps the Wizards as well) hoped that Singleton would provide some kind of significant contribution when he returned from a foot injury. Thus far…not so much. Very small sample size, however. Maynor’s production has slipped below replacement level. Seriously, the Wizards would do better (or at least do no worse) giving his minutes to someone from the D-League. What’s scary: as bad as he’s been, Harrington, Rice, Temple and Seraphin have been worse. The Wizards will need to either a) get some level of production from The Bench That Grunfeld Built, or b) bolster the bench with a trade or from the D-League. Without radical improvement from its reserves, this team seems perfectly constructed for a first-round playoff ouster — regardless of the opponent.